KST is proud to introduce a new line of specialty servos for 700 class helis. These high voltage servos are digital and feature metal gears. Housed in an aluminum machined case, they can be operated at 6.0 VDC all the way up to 8.4VDC. The BLS805X is a high voltage tail lock servo, while the BLS815 is perfect for cyclic control on 700 class helis. Both servos weigh in at 70g and use a brushless motor. 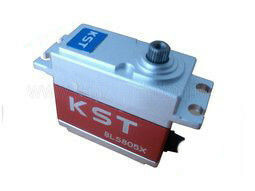 KTS also manufactures a line of wing servos. Check them all out at Hobby Club.